For other people named Ben Lee, see Ben Lee (disambiguation). Benjamin Michael "Ben" Lee (born 11 September 1978) is an Australian musician and actor. Lee began his career as a musician at the age of 14 with the Sydney band Noise Addict, but focused on his solo career when the band broke up in 1995. He appeared as the protagonist in the Australian film The Rage in Placid Lake (2003). He has released eleven solo studio albums. Lee's musical career began in 1993 with the band Noise Addict, who were signed to Steve Pavlovic's independent label Fellaheen Records, on the strength of a self-produced and distributed four-track demo recorded in Lee's bedroom. Pavlovic's connections brought the band to the attention of Sonic Youth's Thurston Moore and Beastie Boys' Mike D, both of whom released the band's material in the US. The group put out several releases on the Beasties' Grand Royal Records. These including the acoustic Young and Jaded EP in 1994, which contained Lee's Evan Dando tribute, "I Wish I Was Him". In 1995, Grand Royal released the band's only full-length album, the Brad Wood-produced Meet the Real You. Noise Addict made a music video for the song "16", toured with Sebadoh, but then broke up. Lee was also briefly a member of the alternative act Gerling. In 2009 Lee recorded a new Noise Addict album, It Was Never about the Audience, with a new lineup; Lou Barlow and Lara Meyerratken. Lee's solo career started at the age of 16, while he was still in Noise Addict. He began recording his first solo album, Grandpaw Would, in both Sydney and Chicago with producer Brad Wood. This was followed by the 1997 album, Something to Remember Me By, also produced by Wood. An alternate version of his song "Burn to Shine", produced by T-Bone Burnett, played over the end credits of the film Best Men. Lee was then featured on the There's Something About Mary soundtrack, with the song "How to Survive a Broken Heart". 1998's Breathing Tornados, released on Pavlovic's new label Modular, marked a new direction for Lee as he introduced synthesisers and increased instrumentation into his sound. The album was a success in Australia, earning Lee ARIA Award nominations for Best Male Artist and Album of the Year. The album's first single, "Cigarettes Will Kill You", was also nominated for Single of the Year and finished second in that year's Triple J Hottest 100. In 2001 Lee contributed a track ("Sweet Is the Night") to a Jeff Lynne tribute album Lynne Me Your Ears. Lee's fourth album, hey you. yes you., was released in 2002. The first single from the album, "Something Borrowed, Something Blue", reached number 67 on the ARIA Charts and number 22 on the 2002's Triple J Hottest 100. The second single, "Running with Scissors", peaked at number 82 on the ARIA charts. In 2003, he also contributed several songs to the Evan Dando solo album Baby I'm Bored. In late 2004, Lee left Steve Pavlovic's Modular Recordings and started his own record label, Ten Fingers. The first release on the label was the single, "Gamble Everything for Love", followed by the album, Awake Is the New Sleep in February 2005, which went double platinum in Australia. A defining release in his career, the album showcased a much brighter, positive side of Lee's personality, in contrast to his previous darker musings. Awake Is the New Sleep received several nominations for the 2005 Australian Recording Industry Association (ARIA) awards, and Lee won Best Male Artist, Best Independent Release, and Single of the Year for "Catch My Disease", which Lee wrote with Mcgowan Southworth. "Catch My Disease" also went to No.2 on the 2005 Triple J Hottest 100. In addition, the song was featured on the soundtracks to the 2005 films Just Friends and Deuce Bigalow: European Gigolo, as well as the soundtracks to the television series, Grey's Anatomy, Hidden Palms and Scrubs. In 2006 it was used in a television commercial for Dell Computers. On 26 March 2006, Lee performed "We're All in This Together" from Awake Is the New Sleep at the closing ceremony of the 2006 Commonwealth Games. The single for "We're All in This Together" was released on 8 April 2006. The CD includes cover versions of the song by Pony Up, Holidays on Ice and Gelbison. "We're All in This Together" is being used in commercials for Kohl's (2008), Coca Cola (Remixed Australian Summer Series Ads in 2007), the South Australian Government (2006), the Salvation Army Red Shield Appeal (2007) and Telus Mobility's "My Faves" (2007). Lee released his sixth album, Ripe, on 18 September 2007 with Benji Madden and Mandy Moore making appearances. Mandy Moore sung a light-hearted, '50s style duet with Lee called "Birds and Bees". "Mandy was very sweet and did her best Olivia Newton-John for me. I'm really psyched about this recording," Lee says. Madden helped out with some backing vocals, along with US band Rooney and Sara Watkins from the band Nickel Creek. Benmont Tench, keyboardist from Tom Petty and the Heartbreakers also contributed. The song "American Television" from the album was used in a VH1 advertisement for Flavor of Love 3 and the song "Ripe" appeared in an episode of One Tree Hill (Season 5, episode 2). In 2007, Lee performed a cover of Crosby, Stills & Nash's "Our House" for Landmarks on The DL. In February 2009, Lee released his seventh studio album, The Rebirth of Venus, which received mixed reviews. It featured guest performances from the likes of Missy Higgins & Patience Hodgson and peaked at No.21 on the ARIA Charts. Lee's eighth studio album, Deeper into Dream, was released on 11 October 2011. It was Lee's first attempt at a concept album, basing the entire 12 tracks around the dream state. Despite not charting, it was received fairly favourably by critics. In April 2013, Lee released his ninth and arguably his most experimental studio album entitled Ayahuasca: Welcome to the Work, with collaboration from Jessica Chapnik. The album is based upon his personal experience with the psychoactive South American drug known as Ayahuasca. Lee featured as the mentor for Joel Madden's team on the 2013 season of The Voice Australia. In June 2015, Lee released his 10th solo album, Love Is the Great Rebellion, his first on a major label, Warner Bros. Records. According to Geoff Wood at ABC, Lee invented the term "Electroyoga" to describe a new form of music dedicated to the practice of yoga. Lee was born in Sydney and was raised in a Jewish household, but did not consider himself religious as a child. He was educated at Moriah College, an independent, Modern Orthodox Jewish, co-educational, day school, located in Sydney's eastern suburbs. Lee dated Claire Danes for several years; their relationship ended in 2003; and he later married actress Ione Skye on 28 December 2008, in a Hindu wedding ceremony in India. Their first child, Goldie Priya Lee, was born on 24 September 2009. In 2008 Lee was nominated as PETA's World's Sexiest Vegetarian. However, according to one source, Lee admits that he eats fish, indicating a pescatarian diet. 2002 67 — hey you. yes you. "Song for the Divine Mother of the Universe"
A ^ The Australian peak for the "Into the Dark" EP is on the ARIA albums chart. "What's So Bad (About Feeling Good)?" 2005 ARIA Music Awards, Single Of The Year – "Catch My Disease"
2006 APRA Music Awards, Song of the Year – "Catch My Disease"
2006 APRA Music Awards, Most Performed Australian Work – "Catch My Disease"
2003 ARIA Music Awards, Best Male Artist for hey you. yes you. The album Awake Is the New Sleep and a selection of other tracks are a feature of the iTunes Music Store Essentials with many singles featuring as a part of the AppleCare Technical Support music on hold. ↑ "AOL Radio Stations | Free Internet Radio | AOL Radio". Spinner.com. Archived from the original on 12 February 2012. Retrieved 2016-04-05. ↑ "Reviews for The Rebirth Of Venus by Ben Lee". Metacritic.com. Retrieved 2016-04-05. Top 50 peaks: "australian-charts.com - Discography Ben Lee". Hung Medien. Retrieved 29 July 2016. "Nothing Much Happens": "Response from ARIA re: chart inquiry, received 24 May 2016". Imgur.com. Retrieved 26 November 2016. Love Is the Great Rebellion: Ryan, Gavin (6 June 2015). "ARIA Albums: Florence + The Machine Debuts At No 1". Noise11. Retrieved 6 June 2015. ↑ "Ben Lee". Pledgemusic.com. Retrieved 2016-04-05. ↑ Annabel Ross. "The Voice | Ben Lee". Theage.com.au. Retrieved 2016-04-05. ↑ "Album Premiere: Listen to Ben Lee's Love Is the Great Rebellion :: Music :: Audio :: Paste". Pastemagazine.com. Retrieved 2016-04-05. ↑ Phillips, Jonathan Talat (24 June 2013). "Pop Singer Ben Lee Comes Out of the 'Ayahuasca Closet' [INTERVIEW]". The Huffington Post. ↑ Molitorisz, Sacha (9 November 2002). "The ballad of Ben Lee". The Sydney Morning Herald. Retrieved 30 November 2013. ↑ "The many layers of Mr. Lee". The Sun-Herald. 2 September 2007. ↑ "A Wedding in India for Actress Ione Skye". People.com. 11 January 2009. ↑ "The 2008 World's Sexiest Vegetarians Are...". Out There. PETA. ↑ "Vegetarian StarShould Ben Lee Be De-Throned?". Vegetarianstar.com. 2008-09-22. Retrieved 2016-04-05. ↑ "ARIA Charts – Accreditations – 2005 Albums". Australian Recording Industry Association. Retrieved 29 July 2016. 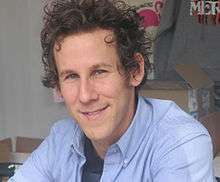 ↑ "BEN LEE | full Official Charts history". Official Charts Company. Retrieved 29 July 2016. ↑ "Previous Winners Song of the Year". Australasian Performing Right Association (APRA). Retrieved 5 May 2010. ↑ "2006 Winners – APRA Music Awards". Australasian Performing Right Association (APRA). Retrieved 5 May 2010.